106 / the tasting panel / march 2014 Not surprisingly, sessionability is a signiﬁcant factor in developing new and innovative spirits and liqueurs. A ﬂavor erring in one extreme or the other is the so-called kiss of death. "When we approached developing Benchmark Flavors, our fundamental goal was to achieve a balance that allowed our whiskey taste proﬁle to stand strong while delivering an interesting and delicious ﬂavor component," says Kevin Richards, Sazerac Marketing Director. "It really is all about balance. We tasted lots of samples before we landed on the Peach and Brown Sugar proﬁles that we ourselves really liked and therefore felt consumers would as well." Most people make a judgment regarding the ﬂavor of a beverage within moments of ﬁrst tasting it. In essence, the fate of a brand could be decided within moments of launching. How does a company best ensure that its product has the ﬂavor it takes to win over the consumers' collective palate in that moment of truth? Anthony Pullen, Educational and Brand Development Manager for Lucas Bols, thinks succeeding at that moment is all about creating a balanced overall experience. "Flavor is based on people's experiences. We've all heard the saying that something tastes like chicken. Our brains are hard-wired to relate the chemical reaction happening on our tongue to a past experience. Color and aroma play a huge role in this, and if you want to recreate a ﬂavor that matches something that already exists, all of these factors have to be considered and matched." Mark Montgomery, CEO of Fishbowl Spirits, makers of Blue Chair Bay Rum, believes there are other contributors to winning the moment of truth. "There's the visual and tactile experience of the bottle to consider—how it looks and how it feels in the hand. Then there are non-tangible cues that create value in the mind of the consumer. After that it's all about the liquid. How enticing are the aromas when the cork is pulled? How does the liquid look when it's poured? And then, yes, the consumers' ﬁrst impressions of the ﬂavor set the tone for re-consumption." "At the end of the day, no matter how much you spend on marketing or package innovation, it's all about the quality of a product's ﬂavor," says Zev Norotsky, Director of Marketing for recently introduced SMOKE Liqueur. Mother Murphy's As is the case with so many things existing in nature, replicating true-to-fruit ﬂavor in a distilled spirit is exceptionally challenging. There are numerous factors that must mesh ﬂawlessly for the process to be deemed a success. Make a mishap and the spirit will develop objectionable off-ﬂavors. When distillers large and small just can't seem to capture the natural essence they are looking for, they turn to Mother Murphy's Laboratories for help. Established in 1946 in Greensboro, North Carolina, Mother Murphy's has grown into one of the country's preeminent ﬂavor companies and is closely aligned with the booming micro-distilling industry. It has at present over 10,000 ﬂavor formulas, including many options for TTB, and continues to create more based on the demands of the market. "In 1997, there were 14 registered distilleries in the United States, and now there are over 400. 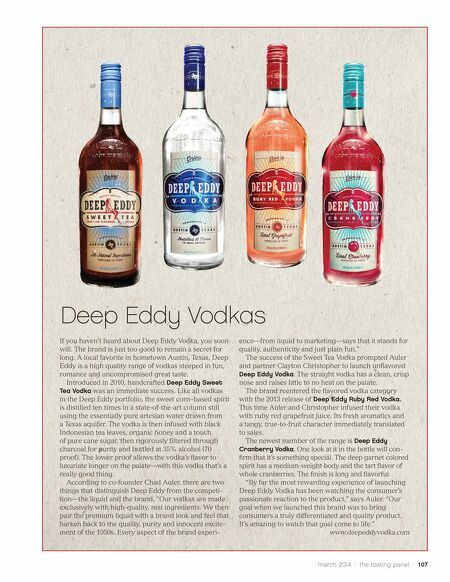 Most of these new spirit companies want to create products that involve ﬂavors," says Al Murphy, Mother Murphy's VP of Sales, Alcohol Division. "The Millennial generation is weary of the old tired labels and want new spirit brands to identify with. Our ﬂavors help achieve just that." Murphy predicts increased innovation in the alcohol industry over the next ﬁve years. "Big companies will continue to innovate to maintain their market share, while new, smaller companies innovate to lay claim to their slice of the market." 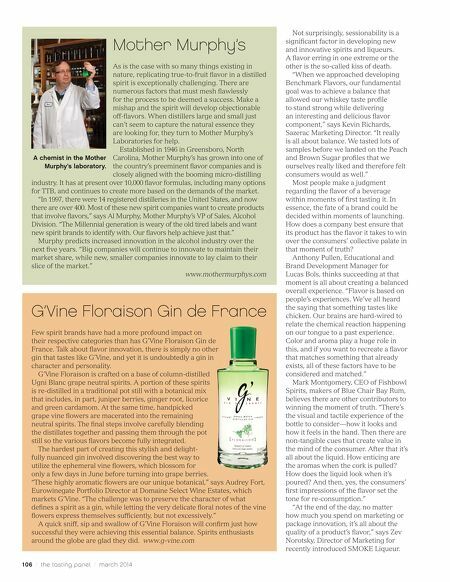 www.mothermurphys.com G'Vine Floraison Gin de France Few spirit brands have had a more profound impact on their respective categories than has G'Vine Floraison Gin de France. Talk about ﬂavor innovation, there is simply no other gin that tastes like G'Vine, and yet it is undoubtedly a gin in character and personality. G'Vine Floraison is crafted on a base of column-distilled Ugni Blanc grape neutral spirits. A portion of these spirits is re-distilled in a traditional pot still with a botanical mix that includes, in part, juniper berries, ginger root, licorice and green cardamom. At the same time, handpicked grape vine ﬂowers are macerated into the remaining neutral spirits. The ﬁnal steps involve carefully blending the distillates together and passing them through the pot still so the various ﬂavors become fully integrated. The hardest part of creating this stylish and delight- fully nuanced gin involved discovering the best way to utilize the ephemeral vine ﬂowers, which blossom for only a few days in June before turning into grape berries. "These highly aromatic ﬂowers are our unique botanical," says Audrey Fort, Eurowinegate Portfolio Director at Domaine Select Wine Estates, which markets G'Vine. "The challenge was to preserve the character of what deﬁnes a spirit as a gin, while letting the very delicate ﬂoral notes of the vine ﬂowers express themselves sufﬁciently, but not excessively." A quick sniff, sip and swallow of G'Vine Floraison will conﬁrm just how successful they were achieving this essential balance. Spirits enthusiasts around the globe are glad they did. www.g-vine.com A chemist in the Mother Murphy's laboratory.